The U.S. Secret Service paid tens of thousands of dollars to President Trump's Mar-a-Lago Club in the span of a few months, according to documents obtained by CNN. 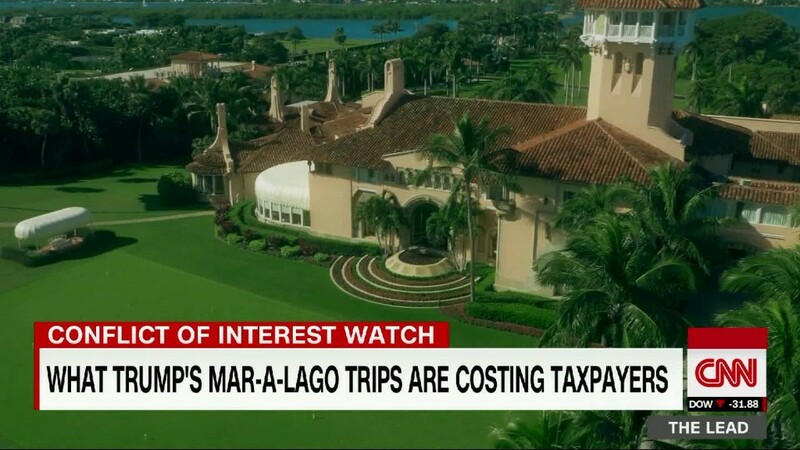 The expense forms show that taxpayer dollars have flowed into Trump's private club as a result of his repeated visits to the so-called Winter White House, which pulls in millions a year from members who pay a premium for its oceanside amenities and bedroom suites. Most of the $63,700 in payments from the Secret Service to Mar-a-Lago were made between February and April, and were categorized as hotel costs on government expense forms. The payments are detailed in forms and more than a dozen invoices on Mar-a-Lago letterhead ranging from $1,300 to $11,050. The purposes of the expenses were not spelled out in the documents, which were redacted before CNN reviewed them. The redactions make it unclear whether there were additional payments to Mar-a-Lago. Experts said the bills could be for rooms rented to agents, space leased for communications equipment or other purposes. The payments to Mar-a-Lago are just a fraction of the total Secret Service costs detailed in the records CNN reviewed, which include bills from other hotels, car rental companies and event services in South Florida. Although the Secret Service routinely pays private businesses for costs that arise while protecting the president, government ethics hawks argue Trump may personally profit from his visits. Or worse, they allege, he's violated the Constitution. The payments appear to overlap with some of Trump's weekend visits to the club in Palm Beach, Florida. After his inauguration, Trump spent a total of 25 full or partial days at the Mar-a-Lago between February 3 and April 16. Trump transferred Mar-a-Lago and his other business holdings into a trust while he serves as president. But he refused to follow precedent by divesting his holdings, and he stands to accrue any business profits when he leaves office. His financial disclosure forms for this year show that Mar-a-Lago made $37 million in revenue between January 2016 and April 2017. The club raised its membership initiation fee in January to $200,000, double what it was a year earlier. While the Secret Service payments are a small share of the revenue, critics of the administration, along with prominent experts in government ethics, say Secret Service payments to Mar-A-Lago could violate a constitutional provision meant to prevent self-dealing and corruption. The domestic emoluments clause bars the president from accepting gifts, or emoluments, other than his compensation from the federal, state, or local governments. Whether the Mar-A-Lago charges amount to "gifts" is up for debate. It may rest on how much Secret Service paid for services or rooms at the resort. That information is redacted on the documents reviewed by CNN. "The president risks violating the domestic emoluments clause if his company is making money off of the Secret Service," said Richard Painter, the former White House ethics lawyer for President George W. Bush. "To avoid that, Mar-a-Lago should either charge Secret Service a rate federal employees are authorized to pay for a hotel room under ordinary circumstances or not charge at all." But waiving all charges could create additional legal issues under rules that prohibit gifts to government agencies. Earlier this year, a government transparency group called Property of the People obtained a receipt from the Coast Guard for a stay at Mar-a-Lago. That document revealed the government was billed the so-called rack rate -- an industry term that usually suggests the non-discounted price for a hotel room. That charge amounted to $1,092 for a two-night stay. Jonathan Wackrow, a former Secret Service agent who served in the Presidential Protection Division, pointed out that, putting ethics arguments aside, the president always requires some level of Secret Service protection. Although some agents could stay at nearby hotels, he said at least some members of the detail must stay with the president day and night in the event of an emergency. "The Secret Service will make every attempt to be financially cautious, but there is an operational necessity for particular people to stay in close proximately to the president 24 hours a day," said Wackrow, a CNN law enforcement analyst. "And they can't sleep in the hallway." He said additional charges to the Secret Service could arise from the need for storage space for communications equipment, or for additional workspace. The Mar-a-Lago expenses, detailed in records released by the Secret Service after CNN submitted a Freedom of Information Act request, are not the first payments made by the Secret Service for the use of a property owned by a White House official. Federal contracting data show the Secret Service has paid about $170,000 to rent former Vice President Joe Biden's property in Wilmington, Delaware since 2011. Democrats have seized on other examples of government money flowing into Trump's businesses to support criticism that the president may be profiting personally from his office. In August, Democrats on the House Oversight Committee requested documents from federal agencies that detail taxpayer money going to products or services "provided by businesses owned by or affiliated with the Trump Organization." A spokesperson said the committee is in the process of collecting responses. The Trump Organization and the White House did not respond to CNN's requests for comment.